As The Promised Neverland, Vol. 9 (entitled The Battle Begins; Chapters 71 to 79) opens, Emma continues to explore “Goldy Pond,” the place they knew as “A08-63.” Now, in a secret room, she and Goldy Pond resident, Lucas, are about to discover the truth about “William Minerva” This mysterious figure is the author of a secret guide book that helps children escape the orphanage slash farms. Will his secrets be everything she's been hoping for? Meanwhile, for the demons, Goldy Pond is the “Hunting Ground,” and they are ready to hunt. THE LOWDOWN: The Promised Neverland manga continues to be one of the best graphic novels currently available, which I always say. It reads like classic dystopian, young adult fiction, but its dark mood cannot eclipse the series' hopeful vibes. 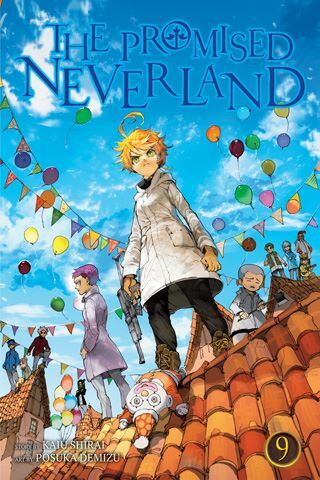 The Promised Neverland Graphic Novel Volume 9 is another top entry in this top-flight series. Like the previous two volumes, Vol. 9 raises the stakes for our young heroes. At the same time, writer Kaiu Shirai and artist Posuka Demizu emphasize in the chapters found in this volume how hopeless the situation seems for the children. Satsuki Yamashita's excellent translation burns like a pot-boiler, making me tear through this book. Every time I get to the last page of a volume of The Promised Neverland, I yearn for the next volume. I think some of you, dear readers, need this kind of yearning.